Most project managers are familiar with Agile and the Scrum Board. Agile works for fast-moving startup teams that need to deliver new products constantly. While Agile has many benefits, it is only one of several ways to manage a project. To choose the system that’s best for you and your team, it’s important to consider all the options. In this short guide, we’ll look at several established project management systems, including PERT, Critical Path, and Critical Chain, to help you find new ways to make your next project a success. Ever since the Industrial Revolution, managers have been seeking better ways to manage projects and increase worker productivity. Henry Gantt came up with his famous chart after working as a mechanical engineer for steel manufacturers. The Gantt chart, with its detailed records of time allocated and spent, provided a way for foremen and factory floor supervisors to track progress and measure worker efficiency. Over the course of the 20th century, project management evolved as a discipline. In the 1950s, we saw the rise of PERT, Critical Path, and Work Breakdown Structures. In the late 1990s, Critical Chain was introduced. And in 2001, a group of software developers met in Utah and published the Agile Manifesto. Each dimension contributes to performance and productivity and can be organized in infinite ways. As technology pushes forward, project management changes with it. While mechanical engineering in the early 1900s required more rigid scheduling, software developers today need more flexibility and immediate feedback. Agile draws its strength from short tasks, daily stand-up meetings, and a free-form Scrum or Kanban board. In other industries, tools and teams look very different. By weighing the pros and cons of each system, we can come up with ways to manage our own projects better. Let’s take a closer look. PERT stands for “Program Evaluation Review Technique” and was created in 1957 by the U.S. Navy for its Polaris submarine missile program. Its focus on hard deadlines provided much-needed efficiency to the production process. PERT is centered around important dates, known as milestones. The most important milestone is the final due date, and managers work backwards from there. To get from one milestone to the next, employees must complete tasks. The project manager identifies tasks that must occur in sequence, known as serial or dependent tasks, and those that can be done at the same time, known as parallel or concurrent tasks. 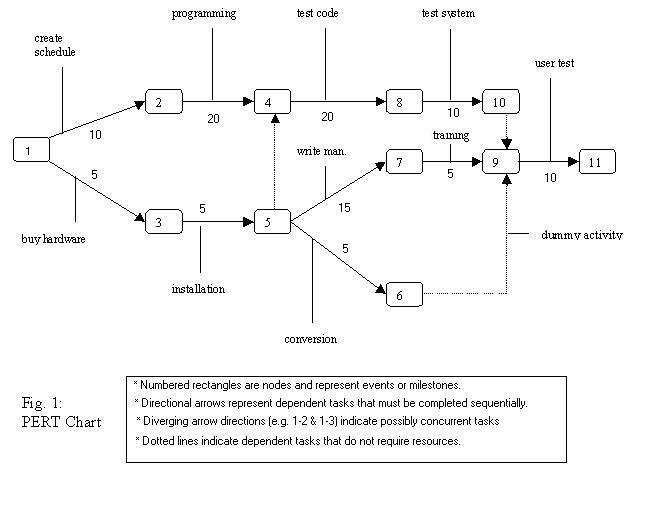 In a PERT chart, the project is plotted out on a flowchart where the nodes are deadlines or milestones, and the arrows represent dependent tasks. Dependencies are represented by the linked pathways that move from left to right. In the diagram above, an engineering project is mapped out on a PERT chart showing dependent and concurrent task flows. PERT was revolutionary in its method to calculate deadlines. A traditional PERT analysis averages three different timelines – the shortest, realistic, and worst-case – to predict likely due dates. You can also plot out the results of your PERT analysis on a Gantt chart, which shows durations and dependencies. The PERT chart can help during the project planning phase, and the Gantt chart can track time usage as the project progresses. Bottlenecks. If the calculations are inaccurate, any delay will create a bottleneck and affect the final delivery date. Nevertheless, if you are looking to add structure and reduce uncertainty in project planning, PERT will help you set up important milestones and the tasks to get you there. Without a comprehensive task list, deadlines won’t be helpful. The Work Breakdown Structure, also developed by the U.S. Department of Defense in the late 1950s, is a system for breaking a project down into manageable parts, including phases, deliverables, and work packages. The parts are all represented on a tree chart. The WBS chart is like a visual outline for your project. Tasks are assigned different levels, such as 1. final deliverable, 1.1 tasks, 1.1.1 sub-tasks, as shown in the example diagram for building a house. One of the main features of dividing a project according to WBS is that all the elements have to add up to the whole. A task cannot be considered complete if 100% of the subtasks are not complete, and the project is not complete without 100% of the tasks. By focusing mainly on task lists and resource distribution rather than deadline events, WBS is complementary to PERT. WBS can also be used with PERT’s close cousin, Critical Path, which we’ll explore in the next section. Developed alongside PERT in the late 1950s, Critical Path Method (CPM) also centers around a flowchart of events and tasks. 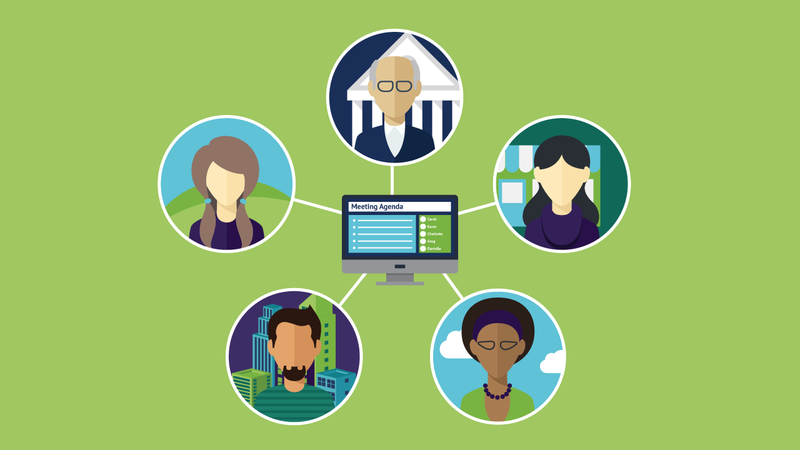 Together, the PERT and Critical Path methods had the biggest impact on the field of project management since the Gantt chart. Critical Path’s main feature is the way it calculates the shortest project duration possible by lining up the longest sequence of dependent tasks necessary to complete the project. The main difference between PERT and Critical Path is knowing how long a given task will take. With PERT, task durations are variable, hence the need to predict time using a model. Critical Path is more useful for projects where task length is easy to predict, such as a construction project or a large conference. Critical Path also factors in slack, or float time, which is free time that emerges due to natural lulls in activity. In the diagram, slack is represented in yellow. Thanks to slack, parallel paths can emerge, and tasks can be completed concurrently. 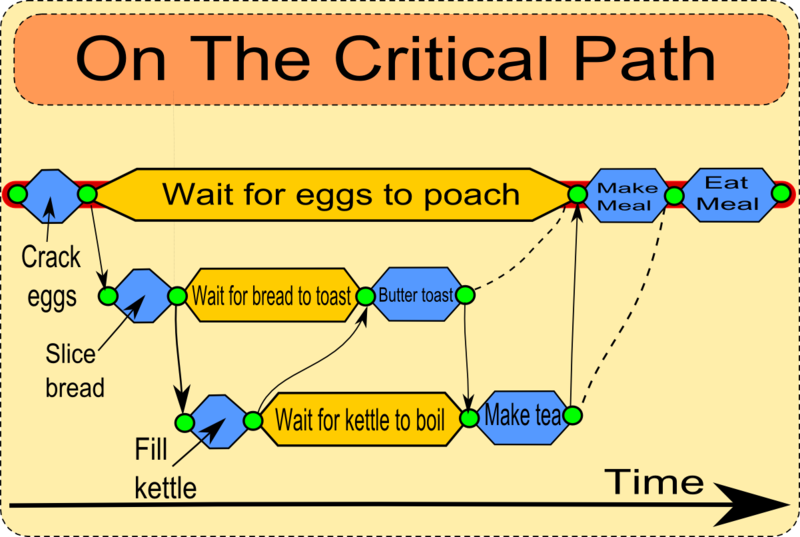 Like PERT, Critical Path imagines a project timeline as a sequence of dependent parts. Once the critical path is established, the hierarchy of parts is made clear. 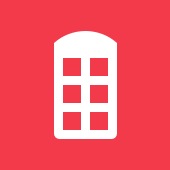 Critical Path projects are designed for maximum efficiency, making sure no second is wasted. Parkinson’s Law states that “work expands so as to fill the time available for its completion,” and Critical Chain aims to minimize its effects. Established in 1997 by Israeli business scholar Eliyahu M. Goldratt, the method is a direct descendent of PERT and Critical Path. It works by repurposing the slack built into projects. Instead of including slack in the task duration, Critical Chain adds a block or “buffer” of slack time between the final task and project completion. The project manager can then add two other types of buffer to the Critical Chain. 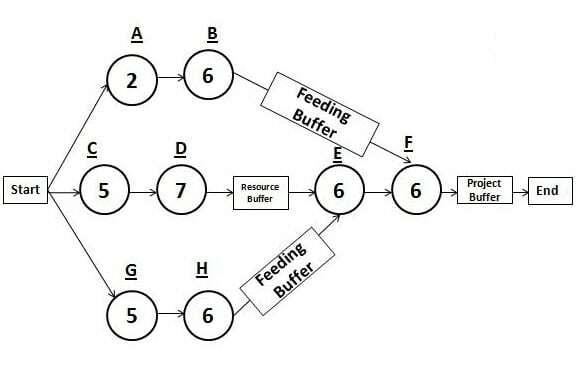 The feeding buffer goes between the completion of non-critical tasks and the critical path. The resource buffer lies along the critical path and allows for extra people, equipment, and/or space to be utilized as needed throughout the project. 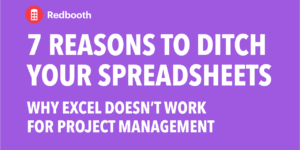 But it doesn’t solve the main drawbacks of PERT and Critical Path: that as project visualizations, these diagrams are mainly focused on time and schedule and less on people, work, and tools. In a Critical Chain process, the project manager can track progress by what % of the buffer is used before the end. If the collective buffer is already gone by the halfway point, the project lacks efficiency. If there’s lots of buffer left at the end of the project, you can use that time to go over the project, test, and otherwise prepare for delivery. New project management methods arise when managers adopt a system and pick up what works and what doesn’t. The evolution from Gantt to PERT to Critical Chain to Agile took around a century, with tons of individualized versions created along the way. By trying out different project management systems, you can find the tools and techniques that work best for you and your team. Ready to start with project management? 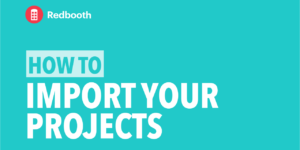 Start a Redbooth workspace today.